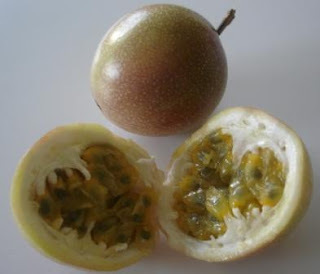 Don’t know how many of you have seen what passion fruit looks like ~ I never had until I arrived here, though I’ve had the juice flavor in stuff before. It really does taste good, just like the juice that you would buy at the store, but the because of the aesthetics of the inside of the fruit, many Americans that I know can’t bring themselves to eat it saying it looks like brains or something. I think it rather funny and I quite like it!